In a nutshell, platforms, open data, and shared components (the building blocks of government as a platform) will make public services easier to build, but won’t on their own make services better. To do that we need to fundamentally change the way that services work in government, and find ways that we can build those services faster. eg. buy a vehicle, import plants, dispose of waste, start a nursery etc. eg. getting permission to do something, exchanging the ownership of a thing, or delegating responsibility to someone etc. We’re calling these ‘service patterns’ - consistent (but not uniform) standards for the way that a repeated activity (like getting permission) should work both for users and government. Like any other kind of standard, service patterns will provide better interoperability between services, meaning that we can more easily join them up across government. Importantly though it gives government a way to know how to provide a particular type of service well. Government services aren’t like other services, there is no established industry standard for, say ‘getting benefits’ in the same way as there is for ‘buying a mobile phone’, because government is often the only provider of that service. That means that anything we learn, we need to learn ourselves. Given how many services do the same thing in completely different ways - and the long tail of those that don’t meet user needs - we need to find ways to change these services faster. Service patterns will be our instruction manual for using platforms and registers to build better services. 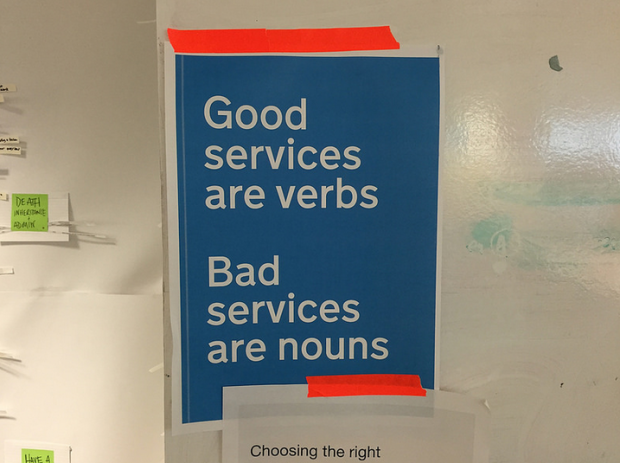 As Matt Edgar wrote recently, most of government is mostly service design most of the time. Sadly, a large chunk of this effort is spent reinventing something that has already been done before. By creating standard patterns for services we can significantly reduce the amount of effort it takes to redesign a service well, allowing teams to concentrate on the things that are unique to their service. What is a service pattern? Most importantly, these patterns will need to evolve constantly, fed by the experiences of those using and testing them in the field - in the same the way that the GOV.UK interaction patterns have grown and evolved over time. It confirmed our assumption that there are huge areas of similarity in these services that do these things - for example we found over 300+ licences that required same process, but were delivered in completely different ways. With users too, there were huge similarities in their needs around these things, regardless of what item they were exchanging the ownership of, or why they needed a licence. There’s still a lot to work out, but this is a useful starting point for finding out what we need to do to change the way that services work in government, and build those services faster. Follow Louise on Twitter, and don't forget to sign up for email alerts. Does this differ from streamlining processes in BPM(N 2.0) (and exporting and identifying standard patterns there)? Hi Louise. As we've discussed a bit previously, performance measurement is an important element, which should be a part of the 4 components, or identified as a 5th. * What range of data should be collected (quant/qual, online/offline)? The sooner we can get this in place the better. There's lot of opportunities here in terms of efficiency and getting rid of siloed thinking. We've already made some strides here to combat this in the Skills Funding Agency. I'm hopeful we can do more of this as we engage across other government departments. Please, please, please can we come up with a common identity management / assurance service? This is a great approach. It recognises the citizen as being at the centre of the design of services, it focuses on delivering services differently, builds in constant improvement which supports agility and identifies where re-use will save time (and cost).